cat eyes & skinny jeans: Colorize Your Eyes! I am a sucker for pretty eyes. My entire makeup routine revolves around enhancing my eyes – which are green; and when I meet someone, the very first thing I notice about them is…their eyes! The length of the lashes, the size, and, above all else, the color. Megan Fox has a brilliant blue, Elizabeth Taylor had an unusual violet, Kristen Stewart has gorgeous green, and Nicole Richie has the most stunning honey color on the planet. We often go out of our way to match our clothing to our eyes to make them truly pop. But getlenses.co.uk gives us the opportunity to do the opposite – match our eyes to our clothing! GetLenses is a mail-order contact company that stocks contacts of a number of brands – Air Optix, Acuvue, and Focus Dailies, to name a few; as well as contact lens accessories like solution, carrying cases, and, one of my favorites, contact-friendly cosmetics. The clincher is that the prices at GetLenses are far lower than standard retail; so if you wear contacts daily, like I do, it makes them far less inexpensive. The area that caught my eye is for Coloured Contact Lenses. I love the idea of having the ability to change your eye color from day to day – even if it’s just subtly. I find that it’s a versatile, painless way to change your appearance without extreme measures. GetLenses features super-stylish colored contacts in blue, green, violet, hazel, gray, brown, violet, and opaque. What I love about the colored contact lenses is the fact that you can choose from a number of different colors from each category, based upon how intense you want the color; so if you choose hazel, you can select from pure hazel, hazel, or honey. And if you go for green, you can select from turquoise, gemstone green, aqua, green, or sea green. I personally love the look of the honey, and the amethyst. Would you wear colored contact lenses? Which color catches your eye? Thanks to Noble Drugstore and Eye Contact Guide for the pictures. FTC Disclosure: This post was sponsored by GetLenses. All opinions expressed therein are my own. I definitely would! I think I'd stay within my natural hue - a hazel. Cool post. Love the gemstone green. How unique! The Amethyst is so shocking. True sapphire looks amazing. I'd so love to do this. So great about being inexpensive. Love the contact colors. There are so many available contact lens these days that are not that expensive so no one has an excuse not to beautify their eyes. Definitely need to look into this site. So glad you posted about this. i tried these. i naturally have black/brown eyes, and it was hilarious. i loved it. i looked sort of like an alien. also, i could not see very well through them, like i cared. hahha. very fun indeed. Oooh I need some green colored contacts! I wear prescription contacts almost everyday, but have never tried coloured ones. They look pretty cool. The focus of my makeup is always my eyes. I love playing them up with eyeliner and dark mascara. Mmm ... Perfection. Wow, I've never heard of coloured contacts before, what a fun idea!! I think I'd have to opt for the amethyst ones, so unusual! I would totally do this if I weren't so scared of contacts. 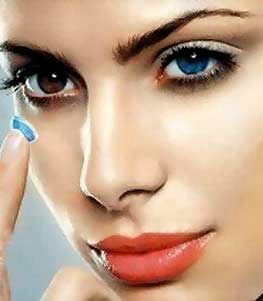 Contact lens is the best way of changing the look of a person, that blue is very attractive. All the colours are amazing, especially the honey and true saphire.